When you say that something is ‘schering en inslag’, you mean that it happens very frequently and that it is a bad thing. Like people dodging fares, or managers collecting huge bonuses whereas other people can’t pay their mortgage anymore (and the latter could therefore also be ‘schering en inslag’). Literally ‘schering en inslag’ translates as ‘warp and weft/woof’. – “Dat is aan de orde van de dag”: that’s the order of the day. This expression doesn’t have a negative connotation by definition, as opposed to ‘dat is schering en inslag’. 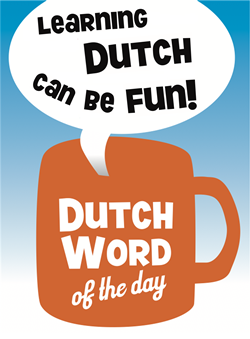 This entry was posted in Dutch phrase of the week, DWOTD 1.0, Vocabulary Intermediate and tagged dat is aan de orde van de dag, dat is schering en inslag, frequent, inslag, normaal, schering by Sander. Bookmark the permalink. We might prefer to say (in the UK) “that’s par for the course”, or “that’s the way of the world”, “or what do you expect?” (but I can see why you might not pick that one given the original text), or even “plus ça change”. So why don’t we wait what other suggestions we get and then we choose a winner! I’m British, and I think “That’s the order of the day” or “That seems to be the order of the day around here”, is absolutely something I would say. I’m a Northerner, so that might have something to do with it.